How to make a necessary accessory - a case for a knife, phone, headphones? Why try to make a case for a phone if you can buy it? Because I want to have an original accessory, which no one else has! Why know how to make knife cases, iphone,Mobile phone, headphones? This accessory is easy to buy at any souvenir or specialized store. And there is no need to say that there are not enough funds. They are even sold in stores "At ridiculous prices"- all for a dollar. In self-made accessories, gadgets look original. If you know how to make a cover, you do not have to think about where to take a small gift before some small holiday. It's even hard to say that it does not fit like a material for a phone case. The only nuance - a knife case is better to make of leather, so as not to injure yourself. 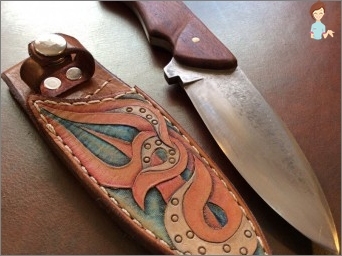 It is necessary to think about how to make a knife cover, if you have to carry it with you often. I must say that it's very easy to make a cover, more time will take up the design of the case. First, a pattern is made - the blade of the knife is drawn on a piece of paper "With a margin"In 5-7 mm. On the contour of the pattern, a leather blank is cut out. The outer edge of the workpiece is glued together. The glue is pierced with a screw through the hole, through which a beautiful seam is made-over the edge or by a stitch "Rope". Everything, the case for the knife is ready, but now you need to think about the strap, thanks to which the knife can be hung on the wall or fixed on the hand. For this, 2 tapes are cut from the skin. The width of one is slightly less than the width of the blade and is approximately equal to the width of the case. It can be fixed in the manner already described - glued and sewed, but it is better to fasten it with special rivets. So fasten the buttons on the jeans. Approximately in the middle of this broad bandFasten another tape - it is just a bit longer and 2 cm longer than the wrist circumference. At the ends fix riveting, which fastens. A stylish case, which you can always carry with you, is ready. 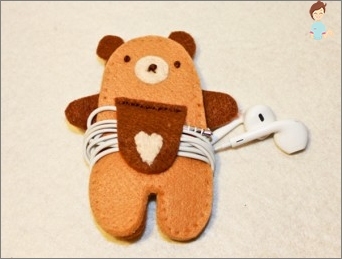 How to make a cover for the headphones, so they are not contaminated and less confused? To prevent the wire from getting tangled, it should be fixed on a tight base in a folded state. You can cut any small figure from a dense fabric: a bear, an oval, a rhombus, a kitten - there is no limit to fantasy. The main thing is that the material is dense enough: the skin is natural or artificial, felt, cloth. The figure is made in 2 copies, glued together "Back"And the tummy. On the front side, with one end, a strip is fixed, and on the other, a hole for the button is made. The button is sewn to the base. Headphones wrap around the figures, fix them - now there is no chance to get tangled by the wire. It is possible to sew a cover for ear-phones in the form of a handbag. In this case, the latch is installed inside. 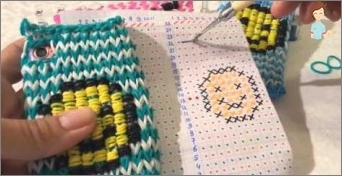 How to make a phone case? Manufacturing technology depends on the choice of material. If the choice fell on the skin, a piece of velvet or a pocket of old jeans, then the accessory is sewn. First, the paper draws a gadget around the outline - this will be a pattern. Do not forget to leave the tolerances on the side surfaces - even the most up-to-date flat phone has volume. Cut the workpiece in a pattern, the edges are stitched, processing the seams. The skin is first glued, and then stitched - decorative large stitches look very interesting. Effectively looks on a leather cover stitched loop. 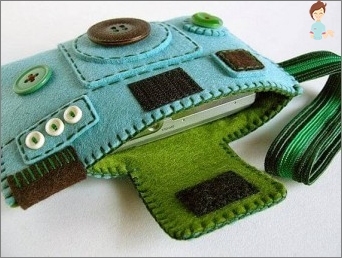 You can make a phone case from any material. Young girls can embroider an exclusive case of rhinestones, young men - paste on it some thematic emblems. Knits are looked original. The case can be tied off with a crochet and knitting needles, the measurements are taken along the contour. The cloth case for the phone is sewn like a pouch. With this operation, even an inexperienced seamstress or knitter can easily cope. 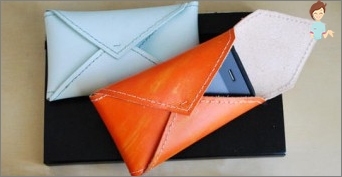 How to make a phone case from paper and why? Usually it is necessary to transport the gadget among things, and the packaging is lost. This precaution will help to protect the product from squeezing. To make a case from Paper, It is necessary to have a sheet of cardboard at hand. On it the necessary sizes are put: length of a gadget, width, height of edges. The central rectangle is the size of the phone. To it are drawn edges - faces, to them admission to gluing, and the second rectangle. When the pattern is folded, you get a box for the gadget. Now it is reliably packed, and it can safely be put in luggage. How to make a phone case made of rubber bands? Method 2: tie with a conventional hook or weave on a special loom. Depending on the model of the accessory, it may take from 500 to 800 color rubber bands. An experienced knitter can cope with the manufacture of an accessory in a couple of hours, and the product will look like a professional one. There is a very original way how to make a balloon case. This case will not only be original, but also the cheapest. When all the air is released, the rubber tightly covers the body. It remains only to cut the hole to use the camera and connect the charger. To make an original case for an iphone or phone, do not need a big waste of materials. It is enough to connect the imagination and allocate a few hours of free time. And when demonstrating an exclusive accessory, the question "Where did you get it? ", You can smile mysteriously and answer:"There already is not! In a single copy, for me, handmade!". And indeed it is really the only copy and handwork!